In preparation for the US Masters, I posted all the maps onto Herald in read only mode. You’ll get a short code that is your army ID – copy this for later pasting. 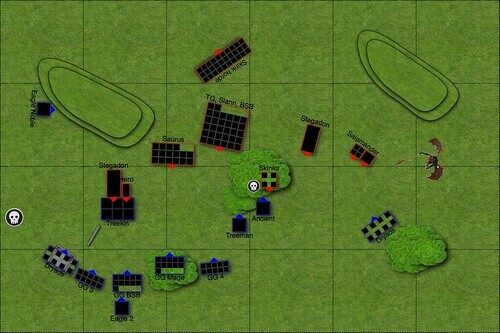 Now you can open up one of the maps above, and merge your army onto it. Open the Report tab on the map of your choice and paste in your army short code. Make sure you check the “Merge” check box and then click Load Report. 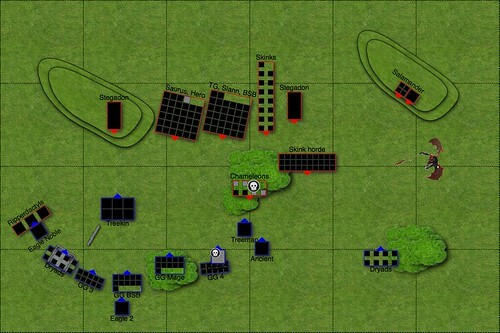 Click “Start Report” to lock the scenery in place, and then have fun deploying your army! This is kind of a spin-out from the forum I started for Seattle area Warhammer players. Drop by if you’re in the PNW area and hang out. Wood Elves are one of the remaining 6th edition books still in circulation. As a result, the models tend to have a much higher points cost than you might otherwise expect in comparison to a similar High Elf or Dark Elf model. This means the armies tend to be a little smaller, and almost always run MSU-style (many units still have model limits on them, which almost enforces this style on players). The flipside of this age is that the Wood Elf player has a bunch of unique and interesting magic items available, as well as a unique set of ‘Spites’ – wood fairies or pixies that come out of magic item allowances. The army itself is divided into the Wood Elves (or Asrai as they call themselves) and Forest Spirits – Treemen, Tree Kin and Dryads – who all look like living trees of some sort. Some Wood Elves are also Forest Spirits, so they get the same special rules as mentioned below – I’ll call out in the unit descriptions which ones are Forest Spirits. Wood Elf players have no units that they want to leave out on their own and take something on in a toe-to-toe fight. Good Wood Elf players maximize their board position to give lots of flank and rear charges, and ideally with two units. All Wood Elves can move and shoot without penalty. They have a standard BS of 4, and their longbows all have a range of 30″ – having a 15″ short range is something to be reckoned with. As you might expect, they all have the Forest Strider special rule also (although it doesn’t apply to flying units if they use their flight move – something to bear in mind if any units end up fleeing through a Forest). 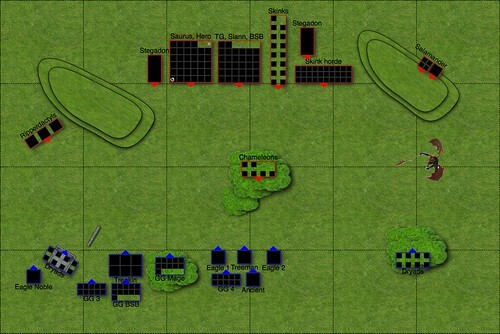 And finally, the Wood Elf player gets to place a free Forest on the battlefield in his/her deployment zone. Technically the forest has to be 6″ in diameter or smaller, but the Citadel Forest is bigger than that. People generally don’t argue unless the Wood Elf player brings something ridiculously large. Forest Spirits all have the same special rules: a 5++ Ward Save that can’t be used against spells or magical attacks; Immune to Psychology; can only be joined by other Forest Spirits; magical attacks. As you can see, they are quite similar to daemons (albeit a little weaker). Elf toughness never goes up, even with Lord characters, but Strength does go up to 4, and Ld goes to 10. Many armies don’t run the Ld10 character, but every other character that sees use will be Ld 9. Glade Guard: The Glade Guard are the backbone of the Wood Elf army, and have special longbows that are S4 at short range. I’m going to repeat that because it’s worth remembering: S4 at anything up to 15″. In a 2500pt army, expect to see 3-5 units of 10, and potentially one larger unit – that one will often run the Banner of Eternal Flame. They have no armor, and will die to just about anything in close combat. Most Wood Elf players will try to avoid close combat with these units. Glade Guard Scouts: Scouts lose their special longbow but have the Scouts and Skirmisher rules. You don’t see too many of these, as you pay a 50% point premium for them. They also have no armor. You will occasionally see a unit of 5-8 for war machine hunting. Dryads: The core representation for Forest Spirits, these angry tree guardians stand out with their S/T of 4 and 2A and I6! They are Skirmishers, so won’t get any rank bonuses. Typically run in units of 8, which is the minimium size, and costs under 100pts – even if you wipe them out they don’t give up many points for the effort. They have no armor save, but their 5++ Ward Save (even with its limitations) can be great at keeping them alive against most infantry. They are most often used for clearing out chaff units or holding up units in a Forest for a couple of turns. Oh, and they cause Fear – don’t forget it! Glade Riders: This fast cavalry unit is not seen very often, again for the poor value for points. They are also only S3, so on the charge get up to S4, and don’t have the special longbows that the Glade Guard do. However, they can sometimes be used as a bunker for a mobile mage. They have no armor, so only a 6+ save from being mounted, and can’t come in a unit larger than 10 so don’t have much in the way of static combat res. Eternal Guard: Technically, these are only core if their general is a Highborn, otherwise they are special, but I’ll count them under core for here. Eternal Guard are medium infantry, with a 5+ AS and Stubborn as long as there is a Noble or Highborn in the unit. They have special weapons which allow them to fight in an extra rank (like spearmen) but give them an extra attack also. These are not commonly seen on the battlefield, but when you do they are often taken as a bus of 25-35, and the front rank will often be entirely characters, with a wizard in the second rank holding the Rhymer’s Harp (which gives the whole unit a 5++ ward, and the Strider special rule). Often one of the characters will hold a talisman of MR so the whole unit gets a 2++ or 3++ ward vs any spells. The wizard will likely be using Lore of Beasts, so they can aim for a boosted Savage Beast of Horros and pump out 35+ S7 attacks. Wardancers: Half naked and tattooed, these Pict-inspired warriors are not the fearsome force they used to be, but are still pretty nasty. They are WS6, immune to psychology, and their tattoos give a 6++ ward save and MR(1), with two attacks (although only S3 – S4 on first round if they charge). Their real advantage is in the Shadow Dances of Loec, special dances they do each round that give some extra benefit. They have to choose a different one each round, so make sure you don’t try to use the same one twice in a row. There are four dances that give the following benefits: +1 attack (for 3 total), 4++ ward, ASF and Killing Blow. Of these, the last is probably the scariest, and the most useful vs enemy wizards. Wardancers are most commonly run in units less than 10 – usually about 8 – and are skirmishers, so if they get a flank charge on a 20mm base, it’s 9 attacks at WS6, meaning a very solid chance of getting that KB they need before the enemy gets any chance to attack back. However, they are only T3 and have just that 6++ ward save so die easily to most missile fire. Warhawk Riders: Almost never seen because they are T3 with only a 6+ AS, and can’t have characters in the unit. These are Monstrous Flying Cavalry, so they are very maneuverable, but very expensive on the points cost and only T3, S4. They do have a nifty rule where they can attack and then fallback out of combat as if they’ve fled, but you can’t pursue and they automatically rally (whether they win combat or not). Most likely they will just die against whatever they charged though, which is why they are rarely fielded. 3 of them fulfill a similar role to 5 Glade Riders but are strictly better for the point cost. Wild Riders: These Fast Cavalry are also Forest Spirits, WS5 and S4 with spears (so 5 on the charge). They also have the same tattoos as the Wardancers, so they get a 5++ ward vs everything except 6++ vs magical attacks, but they are only lightly armored (5+ AS). As they are immune to pyschology, they can’t run the double flee, which is why you still sometimes see Glade Riders / Warhawk Riders. Wild Riders can also be fielded with characters on Great Stags – this puts some extra punch in the front rank with 2 S5 attacks from the stag, plus Stomp. However, this is pretty costly on points so you don’t see it too often. Mostly they are run either as units of 5 to hunt war machines and harrass flanks, or in a unit of 12-15 with the Razor Standard for extra punch. They also cause Fear on the turn they charge, and on any turn they don’t charge they get +1 A in close combat. Tree Kin: These are the Monstrous Infantry cousins to the Dryads, rocking S/T 5 and a 4+ Scaly Skin in addition to the 5++ ward for all forest spirits. They are typically run in units of 6-8, in order to maximize monstrous support (they are too expensive pointwise to run much larger, and have a max unit size of 12 so you won’t ever see a horde). With 3 attacks plus stomps and 3 wounds each, armor and ward saves, they are a tough unit to defeat. These guys also make for prime targets of Wyssan’s Wildform – being S6/T6 is just plain nasty! Cause Fear, as you might expect. They are flammable, so are good targets for Lore of Fire / Metal. Waywatchers: These Skirmishers have Scout, additional hand weapons, a cloak that makes them harder to shoot, BS5 and a special rule that gives them Killing Blow on any shot at close range. However, they cost way more points than they should, and are T3 with no armor. Most often fielded for taking out war machines or because the models look cool. Great Eagles: Flying utility belts for the Wood Elf army. These are used to redirect, to hunt down chaff units, to double flee – expect to see two in virtually every Wood Elf list. S/T are both 4, and they get two attacks at WS5/I4 and a stomp. They are also commonly used as character mounts. Treeman: Important stats courtesy of GW website: WS5 S6 T6 W6 I2 A5 Ld8. These guys can kill almost any other monster in a straight up fight. They have a 6″ range Strangleroot attack which does an artillery dice worth of S4 hits (misfire counts as zero) or S5 hits if the target unit is even partially within a Forest. This attack can also be used to stand and shoot, so it can be good to have your Treeman in a Forest. They get Thunderstomps (naturally), are Stubborn, and have a bound spell called Treesinging, which allows them to either move a Forest d3+1″ (sometimes used to help with defensive positionining of trees) or to do d6 S5 hits against any unit in a Forest – with unlimited range. 3+ scaly skin, cause Terror and are Flammable. Expect to see at least one in most Wood Elf lists, often 2 and occasionally 3. Highborn / Noble: This is the Lord / Hero level combat character. They can take a variety of “kindred” options, which effectively allows them to join special units in the army and gives them the same special rules. Wild Rider and Wardancer kindred choices are both reasonably popular. Here are some common builds you might encounter. “Machine Gun” Highborn. This is often an “Alter Kindred”, which gives the Highborn an extra attack (for a total of 5) and M and I of 9. He is then equipped with the Bow of Loren (1 shot per Attack, with no multi-shot penalty) and Arcane Bodkins (magic arrows where you get no armor save). It’s still only S3 but with the ability move 9″ and shoot 30″, this guy can prove to be a hassle against cavalry. He’ll likely do a wound or two every round and can avoid combat quite easily – he also gets to stand and shoot with 5 shots. He can have enough points left over for a decent ward save, and a GW so he’s not a slouch in close combat either. However, he’s just an infantry model with T3 and so concentrated missile shooting will kill him. Highborn on a Forest Dragon. The Forest Dragon is probably one of the weaker dragons, but it’s still a dragon – S/T/W 6, A5 etc. It has a Poison Breath weapon which gives -3 to AS. The Wood Elves also have a magic item called Stone of the Crystal Mere which grants a 3+ save to bearer and mount (until you fail a ward save and then it crumbles) – it’s virtually guaranteed the dragon rider will have one. Like many ridden monsters, this guy is vulnerable to cannon fire. You also can’t have one and a L4 spellcaster in the any army under 3000 points, so you don’t see him too often. Great Eagle Noble. Usually equipped with Amaranthine Brooch (for a 3+ ward vs non-magical attacks), Dragonhelm and Potion of Foolhardiness. This is a general troubleshooter for the Wood Elf army, and because he’s Monstrous Cav he can’t be stomped. The Great Eagle gives him T4 and 3 Wounds and he has 3+/3++, with a GW for S6. Other armies’ combat characters can easily kill him 1-1 (as I’ve discovered to my disappointment) and of course he has no save against anything magical. Some builds have him with Armour of Destiny or similar. BSB – noble, usually on foot with a Hail of Doom Arrow. This trinket is a one use item that gives him 3d6 S4 shots in one go, which can be used to stand and shoot. It’s S4 at any range. Wardancer characters commonly run with a Potion of Strength so they can get in 5 or 6 S7 (or S8 if he charged) attacks, and/or the Blades of Loec which allow rerolling of any failed rolls to wound. Spellweaver / Spellsingers: These are the Lord / Hero level wizards. The Spellweaver is limited to Life, Beasts or Athel Loren (the Wood Elf lore). You’ll see the first two reasonably equally, and Athel Loren almost not at all. I’ll go into it in a bit more detail below. Life will almost definitely be run in lists featuring 2 or more Treemen. Spellsingers almost never make the battlefield, as they are restricted only to Lore of Athel Loren. However, they do occasionally play the supporting role of scroll caddie – carrying a dispel scroll because the Spellweaver has used her arcane item slot for something else. Wizards can take a special Kindred which turns them into Forest Spirits. At that point they must be mounted, and you’ll occasionally see them on a Unicorn. The Unicorn counts as Monstrous Cav and gets +2 Strength on the charge (for S6). The mage will then often be armed with Fencer’s Blades and will be able to deal with some chaff units. The Unicorn gives MR(2) to the whole unit, so when running with Wild Riders they will have a 4++ Ward vs spells (6++ base comes from tattoos). There are three Wood Elf Arcane magic items that are commonly used. One is the Wand of the Wych Elm, which allows all dispel attempts to be re-rolled. Another is the Deepwood Sphere, which is less common, but will do a S5 hit against any models in the same forest as the wizard at the start of the wood elf magic phase. And finally there’s the Divination Orb, which gives the wizard a free dispel dice if the opponent casts a spell with more than three power dice. Branchwraith: You pretty much never see the Branchwraith. This is a hero-level Dryad, who can be upgraded to a L1 spellcaster, but again restricted to the Lore of Athel Loren. She’s very expensive for what you get, can only go in units of Forest Spirits, and can’t take magic items, which is why you don’t see her. If you do, it’s likely because the general wanted to take a Cluster of Radiants (a Spite) which gives an extra dispel dice every enemy magic phase. Treeman Ancient: This is a Lord level Treeman, whose profile is identical to the regular Treeman, but with Ld9 and the ability to cast Treesinging twice (remember it’s a bound spell, so you can throw 1 dice at it and not worry if the first attempt fails). He can be the general in the army, which gives him an 18″ leadership bubble as he’s a large target. He can also take up to 100pts in Spites (full details on those below). You’ll see this guy in lists with 2 or more Treemen quite frequently. He fits in with a L4 spellcaster in 2500pts. I’ll detail only the ones you’re likely to see at a competitive level. Spites can be taken by any wood elf character. Annoyance of Netlings: Character can only be hit on 6s in a challenge. You’ll often see this on a Treeman Ancient or occasionally on a combat build Highborn (on an Eagle or with the Alter Kindred most commonly). Cluster of Radiants: Only Treeman Ancients or Branchwraiths can take this one, and it gives an extra dispel dice in each enemy magic phase. There are two spites that give d6 S2 poison attacks. One works as a shooting attack always hitting on 4s, the other as extra close combat attacks. Lamentation of Despairs: This is a bound spell, one use, target any model. Pass a Ld test or suffer D3 automatic wounds with no saves of any kind. Pageant of Shrikes: S4 18″ ranged attack that always hits on 3s and can target any model (even characters in units). These can’t be taken by Treeman Ancients or Branchwraiths, and many of the kindred choices restrict what magic items can be chosen for that character also. I’ll detail only the ones you’re likely to see that I haven’t mentioned previously in the common character builds. Dawnspear: You’ll see this on Wildrider characters (as they can only take magical spears). If they cause a wound on a unit, the whole unit is at -1 to hit for the rest of that combat phase. Given their very high initiative this makes it quite likely you’ll be hitting on 5s (or 6s in some cases). Hunter’s Talon: A magical bow that effectively gives the Sniper rule (it’s not exactly the same, but close enough). Oaken Armour: Light armour that gives Regeneration. It’s most often taken by Wildrider characters because they can only take Light Armour. Helm of the Hunt: +1 AS, and on the charge +1WS and +1A. This can be significant as it can give a Noble WS7 rather and 6, and make your opponents WS3 models hit on 5s in the first round. Stone of Rebirth: 2++ Ward when one 1 wound. There’s a debate as to whether you continue to get the 2++ Ward if you are subsequently healed (ETC rules that you do, GW has yet to comment). There are several other items that give different types of Wards with restrictions of some sort but the ones I’ve mentioned are probably the most common. Moonstone of the Hidden Ways: This last item I’ll call out because it can be used to catch an opponent unawares. It’s one use only. If the bearer and their unit are wholly within a Forest in the Remaining Moves subphase, they can teleport to any other Forest, in any formation and facing any direction (including the Forest that they are in). They can even use this to get out of combat. You’ll frequently see this on a wizard, bunkered in a unit of Wardancers for example – great way to both get out of trouble and go cause trouble in your backlines, should you have a Forest back there. You won’t see this lore used much. It doesn’t have a Lore attribute for a start, you can’t boost any spells, and there are only 6 of them – the #1 spell being Treesinging (as described above) which you can substitute for in the same manner as a signature spell. I’ll briefly describe the other spells. All these spells have a range of 18″, and the highest casting cost is 11. Fury of the Forest: Direct damage, d6 S4 hits, or S5 hits if you’re within 6″ of a Forest. Hidden Path: Target unit treats all terrain as open ground and can’t be harmed by non-magical missile fire. Spell ends if they get into combat (or at the beginning of the next WE magic phase). Often cast on Treekin or Treeman to protect them until they get into close combat. Twilight Host: Target unit causes Fear, or Terror if it already causes Fear, until next magic phase. Not a big deal for Lizardmen (or indeed anyone these days). Ariel’s Blessing: Target unit gets Regeneration until next magic phase. Call of the Hunt: Similar to walk between worlds, this moves a unit 2d6″ toward the nearest enemy unit. If the unit is already in combat, all the models get +1A for the next round of combat. Wood Elf players want to protect their Glade Guard and will concentrate their fire on a single unit as much as possible in order to eliminate it entirely. The longer they can fire at you, the weaker your army becomes, and it can mount up quickly. As a Wood Elf player I’ve taken out Daemon Princes, Chimeras and Hellcannon with combined Glade Guard fire – all while keeping my Glade Guard safe with Treeman, Treekin and Dryads. It’s unlikely they’ll survive a round of combat against almost any close combat unit, especially if taken in 2 ranks of 5 as they often are. As a Wood Elf player, every turn your Glade Guard are alive it’s like you get two magic phases – one with your wizard, and one in the shooting phase. When an enemy takes that away, they’ve taken out the major Wood Elf advantage. Treemen and Treekin will be supported by Dryads, Wardancers or Wild Riders to ensure a flank attack as much as possible. Waywatchers, Scouts, Glade Riders or Warhawk Riders will be used to take down anything weak that tries to remain in the backfield (usually war machines or wizards). If your opponents knows he/she is facing Wood Elves, they will likely take some kind of flaming attacks to double wounds against your Treekin or Treeman. Good Wood Elf players usually have one of the Dragonhelm or the Dragonbane Gem in their armies (or both!) to try to nullify flaming attacks for just such a circumstance though. Wood Elf BSBs will almost always stay within range of the Treemen and/or Treekin and are often relatively unprotected (apart from being bunkered in a unit). 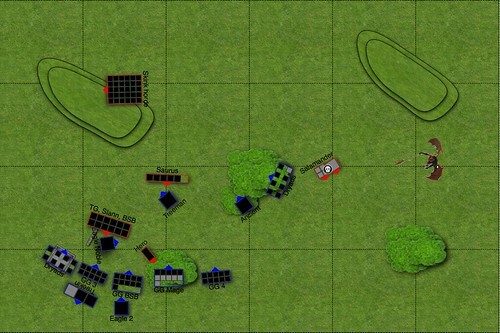 This is my first battle report (finally!) after discovering some local Warhammer players and getting together for a few regular games. Given the amount of effort involved in creating these reports, I can see that I really need to write some more code for Herald to make this job much easier! This was a 2500pt battle, and I was playing with my Wood Elf army. General (Spellweaver): Dispel Scroll; Level 4 Wizard; Lore of Beasts. Treeman Ancient: An Annoyance of Netlings. BSB (Noble): Asyendi’s Bane; Hail of Doom Arrow; Dragonhelm; Battle Standard; light armour. Noble: Potion of Foolhardiness; Armour of Fortune; Dragonbane Gem; Great Eagle; spear; light armour; shield. 10 Glade Guard: Lord’s Bowman; Musician; Standard Bearer; Banner of Eternal Flame. 10 Glade Guard: Lord’s Bowman; Musician; Standard Bearer. 10 Glade Guard: Musician; Standard Bearer. 6 Tree Kin: Tree Kin Elder. Mount: Cold One; suffers from Stupidity. 30 Saurus Warriors with full command. 30 Skinks; javelin and shield with musician. 15 Skink skirmishers with blowpipes. 26 temple guard with full command. The terrain in this game was set up by an independent player, who I think took pity on me and put two Forests on the board. 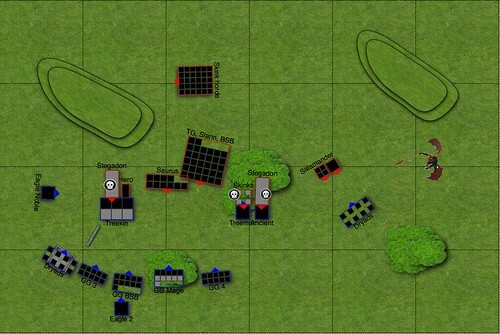 I won the roll-off for choosing board side and took the side with the Forest on it, and deployed a third Forest in my deployment zone. There was a Watchtower on my side also, worth 100 VPs, and the statue on my right flank was a Sinister Statue that shot beams out of its eyes at anything within 6″. I popped the Dryads in the Watchtower, the other unit over on the far flank, and deployed Eagles and Treeman behind the center Forest, all while waiting to see which flank my opponent would deploy his big combat blocks. Knowing his army ahead of time really helped me here, because I knew it would take him a long time to reach me with slow moving Saurus. When put his Saurus and TG blocks down, I set up my Glade Guard down a narrow channel, with my Treekin, forcing his large blocks to either go through the forest or down a narrow channel where I’d be able to shoot at them as they advanced. It’s worth pointing out that we were a good two hours behind schedule at this point, so the game went into the wee hours of the morning. A lot of that was my unfamiliarity with the rules and taking too long to make decisions. If I’m going to compete at the tournament this weekend, I’ll need to be much faster at these things. This also explains why some of my memories are a little muddied. Rolling for spells I got Transformation of Kadon, Savage Beast of Horros, Flock of Doom and Amber Spear. I traded Flock for Wildform. His Slann was rocking High Magic again, so got all those spells. The Ripperdactyls have a special toad which got placed on my Treekin unit (this gives them extra buffs against the Treekin). My opponent won the roll for first turn and the bulk of his army pushed forward. The Ripperdactyls came down on the left flank, poised to charge into either the Treekin or my vulnerable Glade Guard bunkers, and inviting a charge from my Eagle Noble. The winds of magic came up as box cars (12), and my opponent cast a few High Magic spells. His buffs went off, but anything directed against me was either dispelled or ineffective. (This was probably the best roll my opponent got all night: after that, his dice luck went downhill.) The Chamelon Skinks killed one of my eagles with their poisonous blowpipes and his Stegadon had a bow up on top that shot and missed my archers. In my turn the noble charged into the front of the Rippers, quaffing his Potion of Foolhardiness. The Treekin pushed forward, ready to meet the charge of whatever the Lizards were prepared to throw at them, while the Glade Guard took good positions for archery. The Winds of Magic weren’t blowing too hard, but enough to help the two Treemen kill four of the six Chameleons with a combination of Treesinging and Strangleroot. The Glade Guard shot at the leading Saurus unit, but at long distance only managed to pick off one. The Noble and Ripperdactyls managed to pull off the world’s most accurate pillow-fight, with neither side wounding the other. This caused the ‘dactyls to lose their frenzy and thus any bonus they might have had for fighting the Treekin. The Saurus Hero (I think he was a Scar Veteran) charged out of the unit of Saurus on his Cold One, and into the Treekin, joined shortly thereafter by the Stegadon. (Oh, just realized that the Stegadon didn’t get the +1 combat resolution for charging down the hill … not sure how much of a difference that would make, but worth remembering!) The right flank of the Lizardmen pushed up and in, with the skink horde slightly overlapping the central forest, and the skink skirmishers almost entirely in it. The chameleons ducked through the two Treemen and took a few blowpipe shots as they went, causing a wound on the Ancient. The magic winds blew cold (3) this turn, but warm enough to give his Stegadon a Hand of Glory bonus to his weapon skill. The Salamander spat at my Dryads, landing right on target across four of them, but failing to wound at all. Close combat saw a couple of wounds on the Treekin and one on the Stegadon, with the Treekin standing fast in the onslaught. The pillowfight ended with the Noble doing a couple of wounds and taking none back, the ‘dactyls breaking and fleeing the battlefield. In my turn I charged his Skink horde with the Ancient (he stood and shot, doing one wound) and the Dryads (he fled). I had nowhere to redirect to and no way to redirect the Ancient so no successful charges on my part. In hindsight, charging with the Dryads or Treeman would have been sufficient – not sure what I was thinking at the time (maybe I was looking for an aggressive overrun?). I repositioned my Eagle and Eagle Noble. The sinister statue decided now was a good time to take a pot shot at the Salamander, doing a wound. This magic phase I think saw a Wyssan’s get dispelled, but some Treesinging take out half of the skink skirmishers, and the remainder decimated by Strangleroots. The Glade Guard finally had the Saurus in close range and rolled amazingly well, taking out about ten warriors. My dice rolling from this point onward is probably what contributed most to my side of the game. The Treekin matchup continued with I think a wound or so on either side and everyone staying put. Top of the third saw the Saurus unit fail to charge (double 1s!) and the Skinks in the forest charge my Treeman, to enable the Stegadon on the right flank charge into my Ancient – both Treemen misfired with their stand and shoot! I was a bit disappointed by this because the charges were in a Forest so the Strangleroot would have been at S5, but such is life. The statue shot one of the Salamander’s handlers, which obviously upset the beast enough to cause it to miss doing any damage to the Dryads. The Skink horde rallied and headed toward my Eagle Noble. The winds of magic were medium, but my opponent miscast and wiped out some of his own Temple Guard. However, I believe he got a Hand of Glory off on his left Stegadon, boosting it’s Weapon Skill which helped it do some more wounds to my Treekin – in that round I think I took four wounds, which was the best result for the Lizardmen so far. Thankfully the Treekin stood their ground. On the other side of the table, the Skinks were wiped out by the Treeman (no surprise), and the Stegadon’s impact hits were low (I think he rolled a 1) and shrugged off by the Ancient. The ensuing combat saw a wound or two on either side, with my Stubborn Treeman holding his ground at the end. This turn was definitely when the tide of the battle changed. I brought my Noble back down to be ready to charge the flank of the Stegadon/Hero/Treekin combat, and charged the Treeman in to help his Ancient buddy versus the Stegadon. The magic phase backfired as I tried to cast Wyssan’s on the Treekin – it succeeded irresistibly, and my Wizard and the bunker took a S10 hit, wiping out half the unit. Not put off by this, the Glade Guard then let loose another deadly volley of Asrai archery on the stumbling Saurus, whittling them down to ten Warriors. The Wildformed Treekin put the hurting on the Stegadon, killing it outright – unfortunately that didn’t phase the cold-blooded Hero who stood his ground. The Treemen, not to be outdone by the Treekin whippersnappers, beat the Stegadon to a bloody pulp. The statue now took a shot at my Dryads, but thankfully missed. The Saurus failed to charge (again! ), the Skink horde pushed up the hill and Temple Guard (who now had enough room behind the Saurus) attempted to charge into the Treekin – after we took a second look at it, it felt like the angle wasn’t there to allow them to do that so they instead pushed up toward the Watchtower. Things get a little hazy here as it was now quite late. I think his BSB may have been able to make the charge out of the unit of TG and he came into the combat with the Treekin (apologies, I only took one photo for every two turns which is why there’s not a turn-by-turn image of the battlefield). The salamander spat at the Dryads, killing one, and the Treekin took a wound in the close combat but stayed put. During the Wood Elf turn, the Treemen repositioned to ensure the Saurus never reached the Glade Guard. They weren’t quite swift enough to prevent the Temple Guard from sweeping by though, so the Eagle Noble came in to help out there. The Treekin rallied and turned around to get back in the fight. A good magic phase allowed the Spellweaver to cast a boosted Amber Spear through the flank of the Temple Guard, wiping out six of them. Glade Guard shooting then combined to whittle them down to just two ranks. Strangleroots from the Treeman got the Saurus down to just five models (rolled an 8 on the artillery dice) and finished off the Salamander (either that or the Dryads charged and killed it – I can’t remember). The final turns saw all but a couple of the Saurus and Temple Guard killed through close combat, the Hero die to Treesinging / Strangleroot and me lose about another five Glade Guard to the close combat with the Temple Guard. At that point we called it a day, as it was now two in the morning and it was clear that the Wood Elves had won. I made the battle report using Herald. I discovered (and squished) a few more annoying bugs, and now that I have an hour bus-ride in the morning, I should be able to do some active development work on the project. Anyway, thanks for reading. Score one for the Asrai!